1 What is a Lawn Sweeper? 2 How Does a Lawn Sweeper Work? Lawn sweeping can feel like a daunting chore, especially if it’s done manually. Some people even hire professional teams or individuals to clean up their yards, which sounds great at first glance. Leaves continue to fall and you will have to keep hiring professionals again and again, which will add up. For this reason, having your own lawn sweeper (also called a leaf sweeper) is a must. Lawn sweepers are great because, in addition to collecting leaves, they will help with managing sticks, pines, twigs, and other debris. All of this gets collected and put into the yard sweeper’s hopper. Some believe that a push lawn sweeper is more of a luxury item, but it’s a matter of practicality, too. They save so much time that would’ve been spent tediously raking up leaves. Another great benefit of these machines is that they gather all of the plant matter into a designated place. Having it all in one spot will make it easier to compost when you’re done sweeping, reducing hassle for you. 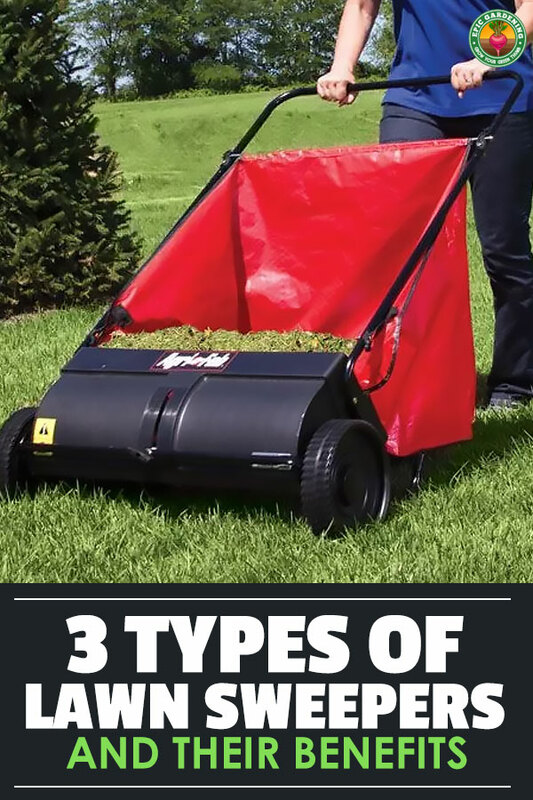 To help you choose the best lawn sweeper, we’re digging into how to buy one, what to look for, and the best sweepers in each category. Below is a quick list of the best ones on the market, but we’ll also cover them in more depth later on in the article. Best Large Lawn Sweeper: Ohio Steel 50SWP26 Pro, 50″/26 cu. ft.
Brinly STS-427LXH Tow Behind , 42″ / 20 cu. ft. There are many different reasons why a tow behind lawn sweeper is a great investment. In addition to clearing up your lawn, it can be used to clear out dust and dirt from your patio, sidewalk, or driveway. A clear lawn means your lawnmower has to do less work. A lawnmower that has to do less work will last longer and require less maintenance. Giving your lawn a good sweep every now and again also lengthens your lawn mower’s life by reducing debris for the blade to get tangled up with. To see how that works, and to learn more about extending the life of your lawn mower, check out this article. How Does a Lawn Sweeper Work? Lawn sweepers function by using brushes connected to a rotating shaft to comb through your lawn and collect debris. This debris is then placed into the machine’s hopper or collection bag, which can be emptied as needed. If you’re new to this concept, it can seem confusing. What’s the different between a pull behind lawn rake, pushable leaf sweeper, or pull behind grass catcher, for instance? We will cover all of that, and then instruct you on finding the best of the best sweepers. Let’s look at the different types of pull behind grass catchers and pull behind lawn rakes, so you can find the best sweeper available for your needs. Example of a gas-powered lawn sweeper. Also called grass sweepers, power sweepers are either electric or gas powered and help make it easier to clean out large areas outside. They often come with a shredding device, reducing debris volume and making it easier to get rid of. Easy to Operate: These models are self-propelled, pushing themselves over your lawn at a speed that is comfortable to walk at. The brushes are motorized, picking up larger amounts of debris than push sweepers. Heavier Machines: Although some of these models do propel themselves, their weight makes them more difficult to maneuver than other options. In addition, they emit more dust, vibrations, and noise, making your hard work less of a relaxing experience. 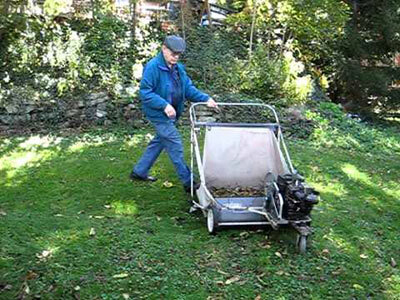 A lightweight push lawn sweeper example. Push sweepers are similar to a rotary mower and meant to be light and easy to use. They are nice to use and quiet since there isn’t any noise from an engine or noxious fumes. Plus, without a motor or engine, there isn’t much that could go wrong with a push sweeper. Minimal Maintenance: Push sweepers only need maintenance about once a year. Just lubricate the bearings and the device will last years. They are perfect for small amounts of debris but may not be as suitable for wet, heavy clumps of material. A Smaller Hopper: In exchange for a more minimal design with less maintenance, the collection bag (hopper) on this device is a lot smaller, meaning that you have to do most of the work. They aren’t very practical for large properties or steep terrain. Essentially, a simple, small push sweeper is great for smaller lots that need maintenance once a week. In addition, certain neighborhoods have rules against power equipment noise, so in some cases, non-electric sweepers are the best option. A larger capacity tow-behind lawn sweeper example. Tow-behind lawn sweepers are for those who need larger capacity to hold debris and want a more efficient sweeping process. For large yards, it makes sense to go with a tow-behind because of the incredible time savings you’ll enjoy. Incredibly Efficient: These attach to tractors or ride-on mowers, making them hyper-efficient for your yard. You can also interchange them with other attachments to get a variety of yard work done in one fell swoop. Huge Hoppers: Because these aren’t operated by hand, they often have large hopper capacity (anywhere from 20-25 cu. ft.). This makes them efficient sweepers if you have a large yard or are a commercial lawn maintenance company. If you are hoping to get more out of your mower, selecting attachments, in addition to your lawn sweeper, should be your next task. When you’re using good tools, your product should be capable of multiple tasks, including plowing, raking, hauling, and spreading. Let’s look at a few different attachments you can use. Lawn Sweeper: The subject of our article, the lawn sweeper is the most commonly used attachment for a mower. To make the most use of these implements, make sure you know about proper lawn sweeper maintenance. To learn about fixing your lawn sweeper in case of any issues, check out this video. Aerators: The best lawn aerators will help you make sure the fertilizer is reaching down to the grass roots. It does this by punching holes in the surface, letting your lawn soak up the water and nutrients it needs. Pull-behind Spreader: A quality fertilizer spreader will spread fertilizer or seed over your lawn evenly to help it maintain its beauty all year. Dump Cart: If you have a bigger yard or garden, a good dump cart is necessary for simplifying your projects. These carts are built to transport yard work tools and other necessities, cutting down on the number of trips you need to take. Before you use your lawn sweeper, you need to make sure it’s completely dry. This is because the machine will have an easier time picking up leaves and debris on a dry lawn. Each lawn sweeper comes with a different speed. These varying tractor speeds are meant to help you handle all different types of debris. It’s best to experiment and check out different speeds before deciding what will work best for you. Although it’s sometimes okay to use a lawn sweeper at higher speeds, this should only be done on even ground. To be completely safe, use the sweeper at low speeds to reduce risks of product damage and to extend the product’s overall life. 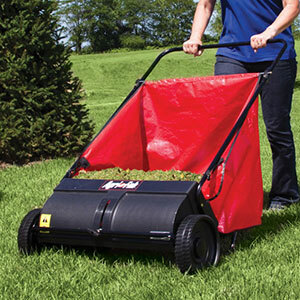 As you use your lawn sweeper, its bag (hopper) will fill up with plant matter. Instead of waiting for the hopper to fill up completely, which will weigh it down, make sure you empty it out each time you use it. The longer the plant debris sits in the hopper without being cleaned, the more prone it is to mold and mildew. It will stay clean and fresh for much longer if you empty it out on a regular basis. In order to get the best sweeper experience, there is some pre-preemptive maintenance you should take care of. Before you use your sweeper, do some chopping, mulching, cutting, or shredding of the debris in your yard. This will lower the risk of your sweeper getting clogged, saving time and making your job much easier. 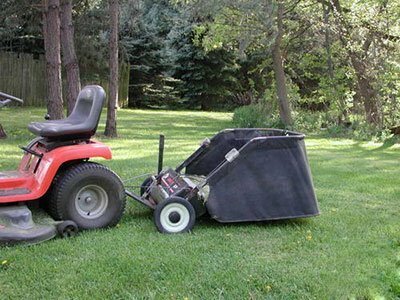 In order to have the best pull behind mower or best push lawn sweeper experience, these simple tips are crucial. Before we get to the list of best lawn sweepers, we’ll go over some of the most popular brands that facilitate these devices. Agri-Fab, Inc. is a garden attachments manufacturer based in Illinois, USA. They supply a wide variety of lawn tools to keep your yard looking its best, including their Agri-Fab 45-0492 and the Agri-Fab 45-0218, which is featured on our list. Ohio Steel is the manufacturer of many high-quality garden and lawn attachments. From lawn sweepers to swivel dump carts, each item they offer has consumer convenience in mind. A little later on, we will get to our Ohio Steel Lawn sweeper review, so you can see if this is the right brand for you. Brinly-Hardy is a US-based corporation that manufactures, designs, and sells lawn care items. In addition to carts, sprayers, and rollers, they also carry a variety of quality Brinly lawn sweepers. A Brinly lawn sweeper is a good choice for yard maintenance. Cub Cadet offers a wide variety of outdoor maintenance tools, including Cub Cadet lawn sweepers. With each of these popular brands in mind, it’s time to cover our best lawn sweeper reviews. Hopper Size: 7 cu. ft. Similar to the Agri-Fab 45-0482, this Agri-Fab lawn vacuum is a fun way to speed up your outdoor work, cutting down on the tedium of raking up leaves. It’s the most lightweight option and is push-powered, meaning there are no clunky engines or machinery to deal with. It’s our pick for the best push lawn sweeper because it’s simple, gets the job done, and comes in at a fair price. Adjustable and Lightweight: This Agri-Fab sweeper is fully adjustable and its lightweight design makes it easier to maneuver than other models. It’s easy to push, even for those who aren’t in great shape and can be hung up for storage. This push lawn sweeper has adjustable settings for height, so anyone can use it with ease. It isn’t very suitable for edging, so keep your broom. Durable Materials: The sweeper has a steel frame and polypropylene housing and is meant to last. Its vinyl bag, which you can replace when needed, is around 7 cubic feet in size. The hopper bag can be disconnected and easily emptied out. This product comes with one bag and one sweeper, weighs 25 pounds and has a warranty of three years. Small Catcher: Compared to some other products, this device’s hopper isn’t very big and fills up fast. Tough to Assemble: You might struggle a bit assembling it, but works great once you have it together. Keep in mind that this will work better on dry leaves and may not function well if you’re trying it with matted down or wet leaves. Hopper Size: 25 cu. ft. This 25 cubic feet, mesh back Agri-Fab sweeper has a hopper that holds more debris than others, reducing the needed time to empty it out. It’s also a heavier-duty tow-behind model instead of a push, meaning you’ll need to attach it to a riding lawn mower or other vehicle to operate it efficiently. Dump Lever: This product comes with an improved dump lever which can be used from the seat of the tractor. The sweeper tongue can be adjusted to sweep and cut in a single pass, no tools required. Adjustable Brush Height: It also has a pull button level for adjusting the brush height. The easy-to-operate indicator won’t ever slip and allows for optimum height adjustment. Sturdy Construction: Not only is this lawn vacuum sturdy and reliable, but it can be collapsed and folded up completely, saving storage space. The hopper on this machine is a lot bigger than most others, but be careful not to let it get too full. The Instructions: Some will find that the instructions that come with this model are very difficult to follow, especially in regards to the hopper assembly. Clover Pins: The clover pins on this sweeper come off and can get lost easily, so keep that in mind. Hopper Size: 20 cu. ft.
For our Brinly lawn sweeper review, we will be covering the Brinly STS-427LXH 20 Cubic Feet Tow Behind Lawn Sweeper, also known as the Brinly 42 lawn sweeper. Put it together, test it out and adjust the height of the brush until you’re satisfied, and you’re ready to go! Storage Design: This Brinly leaf vacuum has a large, 20 cubic foot hopper. It also comes with a 42 inch sweep, meaning less emptying. You won’t need to take many trips across your yard to get the job done. Minimal Storage Needed: This machine’s design allows for convenient, simple storage with minimal space necessary. Simple Assembly: This high-quality sweeper works for sweeping up grass clippings, pine needles, old grass, and leaves. This Brinly lawn sweeper is simple to assemble but does require at least an hour. Loose Knob: The adjusting knob for the brush height may be a bit loose. In order to prevent it from falling off, make sure you tighten it regularly. For extra Brinly lawn sweeper parts, you can consult Home Depot. Time-consuming to Put Together: For those of us who are not mechanics, these instructions are a bit difficult. If you’re assembling this on your own, invite a friend over to help you make sure it goes well. When in doubt, try to consult the Brinly lawn sweeper manual. Hopper Size: 22 cu. ft. The Ohio Steel 42SWP22 Sweeper has a fair price and is made well. It cleans up an acre much faster than other sweepers and can be used long term. Easy to Dump: This product works just as advertised, picks up clippings without any issues, and is easy to dump. Clear Instructions: This model comes with clear and easy instructions. It allows the installer to do each small step separately. Sturdy and Durable: This is a very heavy duty machine and has a huge debris capacity. Keep in mind that this also makes it heavier when it’s full. Dump it more often so you can still use the rope lever. Packaging: The Ohio Steel leaf sweeper will arrive intact and free from damage, but there are no straps included around the packaging. Difficult to Hook up: Hooking this up can be challenge, especially alone. In addition, having a big and sturdy machine means it’s more difficult to store. Hopper Size: 26 cu. ft. 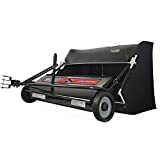 The Ohio Steel lawn sweeper has a sweeping width of 50 inches and a 26 cubic foot capacity hopper. Unique Brushes: This machine has 11-inch spiraled brushes made from polypropylene, a feature exclusively patented by Ohio Steel. In addition, its wide, 9-inch chute will keep the machine from clogging. Collapsible Hopper: The hopper on this device comes off completely and allows you to store it quickly and compactly. It has a very large storage space to hold debris and leaves. The brush axle comes with sealed ball bearings and an included hitch pin. Quick to Assemble: This machine is quick to assemble, requiring only an hour to put together by yourself. Brushes Don’t Disengage: One improvement that this model could have is disengaging brushes. When you are bringing the machine back to your garage, it fills up with more debris. Requires a lot of Space: Since this sweeper is large, it requires a lot of space to store in your garage. It won’t collapse or fold at all so if you’re working with limited space, be sure to keep that in mind. Hopper Size: 27 cu. ft.
Quality Frame: You can tell that this model was created to last a long time by its frame. It comes with six brushes to sweep up leaves and other debris efficiently. Convenient Emptying: For those of us who don’t enjoy spending all day doing yard work, this machine comes with a rope pull hopper for easy emptying from the seat of the tractor. Easily Adjustable Brush Height: The brush height adjuster is easy to maneuver and locks in so that it won’t slip. When you are assembling this device, make sure you have someone to help you and measure from the tractor hitch to the ground before you begin. Cheaply made Bag: Although the machine itself is structured to be durable, the plastic mesh bag it comes with is pretty flimsy. The bag would be much better if it were crafted from quality fabric. Small Clevis Pins: The clevis pins on this model don’t have a dip in the center, leading them to flop around and slide through. A lot of people are unaware of how many benefits a lawn sweeper can bring to them. Most people use rakes to get rid of needles, pine cones, and other debris, but this is time-consuming, hard work. A lawn sweeper allows you to do this in a fraction of the time and with a fraction of the physical effort. In addition, a large capacity sweeper will hold far more material and can be quickly and efficiently emptied from the seat of the tractor. As stated before, this isn’t a cheap investment to make. For that reason, it’s best to first make sure that you will get a lot of use out of a leaf sweeper for your yard. Once you’ve established that, there’s no reason not to make this wise, time-saving investment to improve your lawn care habits. Just make sure you have enough room to store your new lawn sweeper and you’re ready to go!